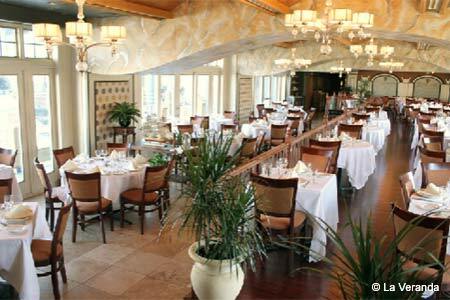 Italian cuisine with a river view and fine old-fashioned service. : At lunch, this is a meeting place for local businessmen and politicos. Windows look out on the Delaware River and its busy traffic, and in summer, the outdoor terrace is lovely for boat-watching. The first thing you encounter is the big wall oven that turns out grilled dishes. Proceed to the array of vegetables, meat and cheeses that form the antipasti table. Or sample one of the seafood salads (cuttlefish, salmon, sea bass) and then move on to pasta. Some are solely made with seafood, or there is penne alla vodka or spaghetti alla carbonara that may strike your fancy. Fish is always a good idea here, grilled simply or sauced. For carnivores, the rack of lamb or veal shank will suit, or select from a grill menu that can rival any steakhouse. Daily desserts include assorted Italian cakes and ice creams besides the dependable crème caramel.